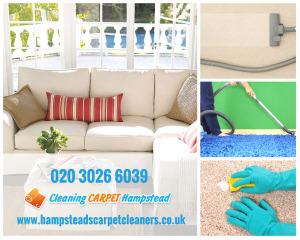 Hampstead carpet cleaners is an experienced company offering professional carpet and upholstery cleaning services in the entire NW3 area. We specialise in carpet steam and dry cleaning, upholstery cleaning, rug cleaning. Our cleaners are friendly, fully insured and vetted and give their best to achieve higher hygiene in your home. Our cleaning services are pet- and kid-friendly, as we use only non-toxic cleaning products. Don't hesitate to give a new life to your carpets by getting the best cleaning service in Hampstead. Choose the most suitable cleaning for your needs and book on 020 3670 5825 or visit our website.